Vapor pressure osmometry was applied to the systems calcium l-aspartate ((S)-aminobutanedioic acid calcium salt) + water for varying molalities of Ca–l-Asp (mCa–l-Asp = 0.01–1.02 mol·kg−1) and guanidinium hydrochloride (methanamidine hydrochloride) + sodium L–aspartate ((S)–aminobutanedioic acid sodium salt) + water, varying the molalities of GndmCl and Na–l-Asp (mNa–l-Asp = 0.1, 0.25, 0.4, 0.57 mol·kg−1 and mGndmCl = 0.1–1.1 mol·kg−1) at T = 298.15 K and 310.15 K. From vapor pressure osmometry, activities of water, and the corresponding osmotic coefficients of the mixtures Ca–l-Asp + water and Na–l-Asp + GndmCl + water have been calculated, both being directly related to the chemical potentials of the different species and therefore to their Gibbs energy. Mean molal ion activity coefficients were obtained from experimental data fits with the Pitzer equations and the corresponding dual and triple interaction parameters were derived for the Ca–l-Asp + water binary system. β(2) Pitzer parameters different from zero are required for Ca–l-Asp in water to reproduce the osmotic coefficient decrease with increasing concentration. Mean Spherical Approximation parameters accounting for Coulomb and short range interactions that describe the calcium and magnesium aspartates and glutamates are given. The decrease in the chemical potential of the aspartates corresponds to the Hofmeister series: NaAsp > Mg(Asp)2 > CaAsp. 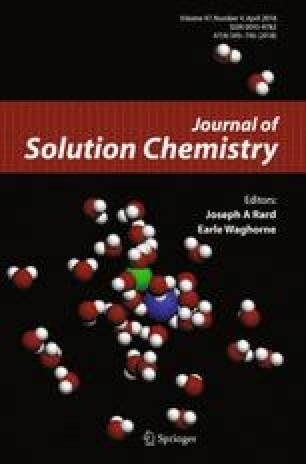 A strong interaction between amino acid and salt due to specific dispersion interactions in amino acid salt systems containing guanidinium based salt has been revealed that is in agreement with MD and half-empirical quantum-chemical calculations. Funding was provided by Scientific-research theme of fundamental studies of Ministry of Education and Science of Ukraine, financed from the state budget of Ukraine. The authors would like to acknowledge gratefully Prof. Vasiliy I. Larin for the permanent help on this research, Olena S. Bondareva, Olesja O. Kulinich for taking part in the experiments.